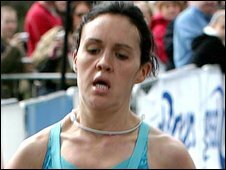 Ireland's Mary Cullen finished second behind Ana Dulce Felix of Portugal in the Great Ireland Run on Sunday. Sligo runner Cullen, in her first 10k on the road, put in a good effort at Phoenix Park to see off Fernanda Ribeiro who finished third. Rui Pedro Silva made it a Portuguese double by winning the men's race ahead of former world marathon record holder Paul Tergat of Kenya. Irish hope Martin Fagan was always in contention and finished third. Silva's winning time was 28 minutes, 45 seconds. Fagan, based in the Unites States and rapidly emerging as a world class athlete, decided to run despite a niggling injury. "I felt flat and did not feel good," said the man who smashed the Irish half marathon record a few weeks ago. "It was horrible but I would not have missed the race for the world as I wanted to run on home soil. "This was my first international competition here and I ran despite suffering from what might be a groin injury - but which I hope is a hernia which I have had before. "I'll have an MRI and keep my fingers crossed when I see what the results are. "I am disappointed as I did want to win and the amount of support I received from the spectators was amazing."